West Hartlepool-born Nigel Heslop won 10 caps for England on the wing. He won his first cap for his country in 1990 during a tour match in Buenos Aires. 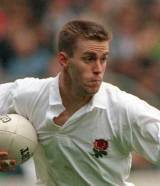 England won 25-12 and Heslop was selected for England's squad for the 1991 World Cup. During the quarter-final Heslop was floored by a punch from France flanker Eric Champ, who had taken offence to a late tackle from Heslop on Serge Blanco, the France fullback. Heslop had earlier in the tournament scored a try as England defeated the USA 37-9 at Twickenham.